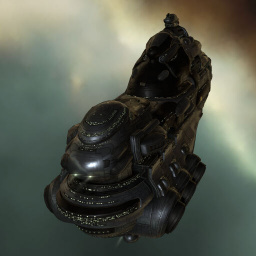 Reacting to the rise of capsuleer capital fleets, the Serpentis Corporation requested that the Angel Cartel’s naval architects design a dreadnought class capital ship. This was done using the Moros hull as the basis for a formidable mobile weapons platform. After receiving the prototype, capital ship engineers from the Cartel’s Guardian Angels division maximized the damage potential of the design. For good measure, the Guardian Angels combined this with advanced Serpentis stasis webification technology. The Vehement is a Serpentis dreadnought. It requires both Gallente and Minmatar dreadnought skills to fly. Further information about additional or recommended skills to pilot Vehement for a specific or it's common role(s) can be written here. No sub-article about Vehement roles or piloting tactics. You can write them here. You can write additional notes for the Vehement here.